Not everyone has the time to head out to the gym or yoga studio every day. Everyone wants to work out and be healthy, but let’s face it– it’s tough. Life gets in the way and there’s always a reason (or excuse) to stay within the comfort of your home and put off the sweating for another day. This is where exercise bikes come in. Ironman is one of the leading manufacturers of these training wheels. The only problem is that because there are so many fantastic Ironman products on the market, narrowing your search to any particular product is much harder than it needs to be. Here we have prepared a list of some of the best Ironman exercise bikes on the market. 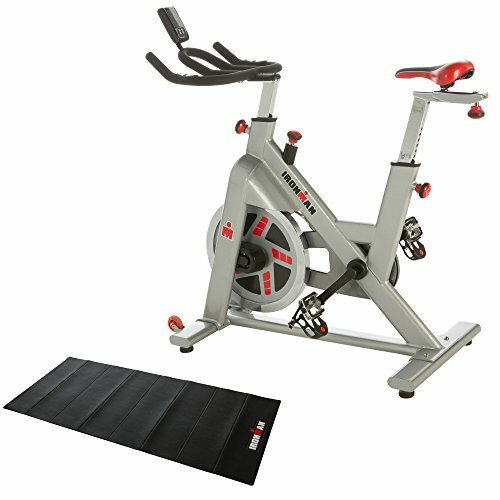 This training cycle from Ironman has been constructed with a heavy-duty steel frame and features a ‘Precision Belt Drive’ for a smooth and quiet ride. The term “Triathlon” has been introduced because of its three distinct possibilities; a 26.2 mile marathon run, a 112 mile bicycle race and a consecutive 2.4 mile swim race. The airsoft seat is comfortable and the computer even reads out time, distance, RPM, calories burned, speed and heart pulse. It’s backed by a lifetime warranty for the frame, 5 years for labor and most major parts, and 2 years for electronic and normal wearable parts. It is easily portable with transportation wheels, and it does not require any electric outlet. The Triathlon’s weight capacity is 300 lbs, and it can be used by anyone in the height range of 5’ to 6’4”. 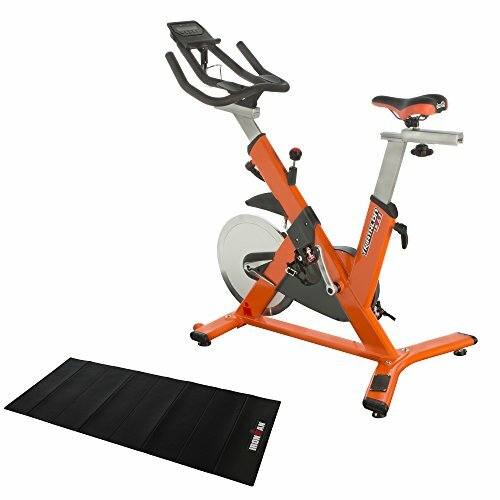 It can be used for 2-directional pedaling and the unit is durable with high performance and endurance. The adjustable hand bar is one of its many unique features. Its hefty price tag seems to be the only part which makes it slightly less appealing compared to similar products on the market. But if you can lash out the cash, it’s definitely worth the money for a healthier lifestyle. 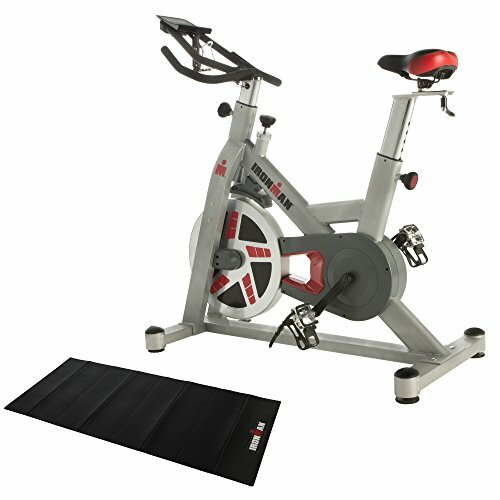 The H-Class 510 Indoor Training Cycle from Ironman is featured with a built-in computer that reads out distance, RPM, calories burned, speed, Watts and heart pulse. It comes with a chest belt compatible for 5.0 KHz frequency belts. The machine has been equipped with adjustable floor stabilizers that prevent rocking and tipping of the cycle. The unit has been constructed with steel frame, weighs 121 pounds and comes with a lifetime frame warranty, and 3 years of warranty for electronics/labor and most major parts. A bonus waterproof PVC equipment mat is included in the packaging for floor protection and noise reduction when exercising. This training cycle from Ironman has been designed with variety of handy features to promote fitness and a healthier lifestyle. The maximum weight capacity for this unit is 275 pounds and the maximum height suitable to ride this training cycle is 6’4”. It’s an all-battery machine and no electric outlet is required. It is also priced right and offers good value for money compared to similar products on the market. The H-Class has been constructed with heavy-duty wide-steel frame construction for extreme durability and endurance. It features multi-grip handlebars for various hand and forearm positions. A smart computer built into this machine displays distance, speed, heart pulse, calories burned, Watts and RPM. The bonus water proof PVC equipment mat helps to reduce noise and also protects the floor. It is backed by a lifetime frame warranty and 3 years of warranty for electronics/labor and most major parts. The maximum weight capacity for this unit is 300 lbs, while the maximum user height shouldn’t exceed 6’4”. Overall, it’s a fantastic product from Ironman that is highly-durable and comfortable. The display screen is informative and comes with plenty of bonus features for smooth riding. This well-designed machine is backed by a decent warranty service; also, the customer service is magnificent. Make sure you have read the manual properly for quick assembly of the unit. All assembly tools are included in the package, which is another plus. It offers good value for money. The Ironman Triathlon X-Class 510 is the best and the most expensive product on our list. If you aren’t turned off by the hefty price tag, go for it. It’s the one with most features and highest quality. The company claims the bike to have been designed for a champion tri-athlete and it’s packed with enough features to live up to that claim. The Ironman H-Class 510 is almost half the price of the Triathlon but it’s by no means a second-rate product. It’s been designed well and comes with variety of bonus packages to make your training enjoyable. Last but not the least on our list is the IRONMAN H-Class 520. It’s superb in its own rights, and the only reason it’s placed third on our list is because of the mixed set of reviews. An indoor training cycle is a must-have machine for anyone who is short of time despite being health-conscious. Make sure you have properly studied pros, cons, and features in order to make an informed decision.